Leslie Sturges asked for someone to flip the light switch off. As the room went dark, she flipped on the spotlight attached to her camera. The lens adjusted back and forth, and back—and then came into focus. “Awwww…,” sighed the room of 40 kids and parents. Sturges held a bat. A brown bat—a Big Brown bat named Smiley. It was a Friday night in Northern Virginia, where regional bat expert Sturges conducted an educational class on bats at the Walker Nature Education Center. As Sturges held Smiley, he ate meal worms out of a bowl and she shared with the kids and parents that bats are in trouble because of a disease called white-nose syndrome. Hands flew into the air. “What’s white-nose syndrome?” asked a parent. “White-nose syndrome is a powdery, white fungus that covers a bat’s muzzles during hibernation, making them sick,” said Sturges. 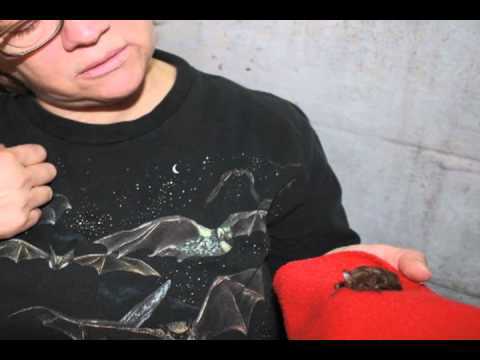 As a wildlife educator, Sturges teaches kids and parents about the importance of bats. As a wildlife protector, she lets kids know they can help protect these creatures spreading the word about white-nose syndrome through Save Lucy the Little Brown Bat campaign. Sturges, president of Save Lucy the Little Brown Bat campaign, was involved with white-nose syndrome early. She remembers when it first appeared 40 miles outside of Albany, New York in 2006, and no one knew what it was. This new disease was identified as Geomyces destructans, a cold-loving fungus that is said to have crossed into America from Europe. Bats are susceptible to white-nose syndrome because the fungus breeds in caves or abandoned mines, popular hibernation spots for 46 bat species found in Canada and the United States. As news about white-nose syndrome developed, Sturges became concerned when biologists and scientists in the Northeast would claim that the public knew about white-nose syndrome. She was more alarmed when policy leaders would tell her that no one really cared about bats. It was that day that Sturges decided she needed to make white-nose syndrome accessible to kids. Save Lucy the Little Brown Bat launched in March 2010. Although Lucy is a fictional bat, she represents all bats that are in trouble because of white-nose syndrome, and provides a story line and pictures for the kids. Sturges runs the Save Lucy Campaign out of her basement and backyard, where she has a bat rehabilitation facility and flight cage, an outdoor screened-in building where young bats learn to fly. Depending on the month, there are 12-60 orphaned or injured bats in her care. An average day for Sturges includes going to work as the Montgomery County Parks Naturalist and then going to a school or library to do a Save Lucy program where she brings along educational bats. “I educate people that bats are not Halloween vampires, but important species that keep insects in check by eating up to one-third of their body weight a night,” said Sturges. And with white-nose syndrome entering its fifth hibernation season (bats enter hibernation October each year), busting Halloween myths about bats is only even half of Sturges battle; it’s finding new ways to use her basement, flying cage, Certified Wildlife Habitat backyard, and Save Lucy campaign to educate all kids and parents that something must be done to protect bats. Since 2006, white-nose syndrome has killed more than a million bats among six species and has spread north to Canada and as far south as Tennessee and North Carolina. As reported by the U.S. Fish and Wildlife Services, in some locations mortality in bat colonies has reached 95 percent. When you arrive at the Save Lucy website, you can take action to help bats, join the Save Lucy Club, record your bat observations and donate to the campaign. With the Save Lucy Campaign turning two in March, the program has picked up, with an average audience of 50 to 100 people in the region. She shows kids real bats, like Mooch and Smiley, goes outside to listen to bats as they echo-locate, and encourages families to get involved, such as building bat boxes for them to have a safe place to go. But most importantly, Sturges encourages people to share Lucy’s story. The clip above is one of Sturges’ bats echo-locating. For additional pictures of the bats in Sturges’ rehabilitation facility click here. Crows, ravens, owls and vultures: Nature’s creepiest birds? Get your “scary” animal fix, from vampires to zombie ants. Take a peek at a “spooky” animal photo gallery … if you dare! Halloween roundup: Get fun outdoor kids’ activities and more.